The Public Health Nuisance Program calls for the Health Department to investigate and subsequently take actions to facilitate the resolution of specified public health nuisance-related conditions per complaints registered with the Department. Categories include but are not limited to air, land and water pollution; open burning, improper storage and disposal of garbage and refuse; stagnant water, and the harborage and/or breeding of vermin. What is meant by the term “public health” nuisance? A public health nuisance, emphasis on the word “public”, is one that has far reaching negative health effects. It has the ability to affect the health, safety, or welfare of the general public. 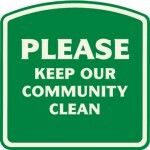 Examples of a public health nuisance would be an impoundment of stagnant water serving as a breeding site for disease carrying mosquitoes, or an outdoor accumulation of household garbage capable of attracting and feeding disease carrying vermin. Both conditions having the potential to sicken a number of surrounding neighbors. So if it’s not a “public health” nuisance, what is it? Chances are, it’s a "private" nuisance or neighbor dispute, and inasmuch would be considered a civil matter between two independent parties. The Kendall County Health Department has no authority to resolve private disputes. Does Kendall County have rules to address Public Health Nuisances? For more information or to register a formal complaint, please contact the Environmental Health Unit at (630) 553-9100 ext. 8026 for more information.